The world is becoming more integrated. What once seemed like the religions of exotic faraway lands are now practiced by families next door. These short, easily digestible readings give an overview of the beliefs, histories, and practices of dozens of religions, including Islam, Buddhism, Hinduism, Christianity, and many more. Garry Morgan blends the knowledge of a college professor with real-world experience and an accessible style. Broken into forty brief chapters, this book can be used as a reference for those who need quick and clear answers or read straight through by curious readers. 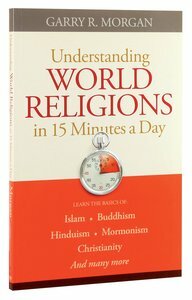 About "Understanding World Religions in 15 Minutes a Day"